Some easy writing advice to follow, offered all the time, is show instead of tell. But it takes careful work to remove showing while you remove filter words from your writing. These are words that make a story less vivid and make the writer more obvious. You don’t want the latter to happen. We tell stories, but we don’t want our readers to focus on us as storytellers. Write memoirs or essays if you want to be seen while you tell the story. Fiction has several key elements, and none of them give writers a reason to show themselves telling. Not even first person. You rarely need these in fiction’s narrative writing. (In dialogue you can do almost anything—but the dialogue has to propel the plot, or reinforce character traits, or make extra conflict). At the hardest end of the filter cutting, thought and decided can be erased by first-person limited point of view. He thought he could wrestle the gun from Steiner’s hand. He could wrestle the gun from Steiner’s hand. The wagon sank in the mud. We should know it’s Randolph doing the watching. Let a reader observe the action itself in the writing. Visuals rarely need watched and saw. Sensations like smell (one of my favorites) should be unique or pungent enough to stand without the verb smelled. The fuzzy one is felt: it’s almost useful while you describe a texture. But the stubble on his chin felt rough can easily become The stubble on his chin was rough. Go through and check your writing during revision. After awhile, you won’t even write first drafts using filters. Voice is harder to teach than it seems. It’s about hearing yourself. That’s why the Amherst Writers methods I use in my workshops are so good for discovering your authentic voice. When you read your fresh writing out loud as we do, in a safe and supportive space, you can hear what rings true. You’ll hear the clear, un-compromised notes from deep in your heart. Hearing your voice can give you confidence to create something like bathos: that juicy anticlimax when you go from the deep sentiment of your heartstrings to something plain, like the taste of sliced cheese. First the heart, then a simple sentence. We work toward hearing the styles of our voices. There’s authentic Original Voice, the one we’re raised with and hear as it tells our childhood’s stories. Then there’s Natural Voice, used for our reports on our own life and the facts of our world. Finally there’s Costumed Voices, the ones we prepare for showing off the characters in our stories. Everybody speaks a little differently. Making these voices distinct is a skill worth polishing. Why is that Original Voice so important? 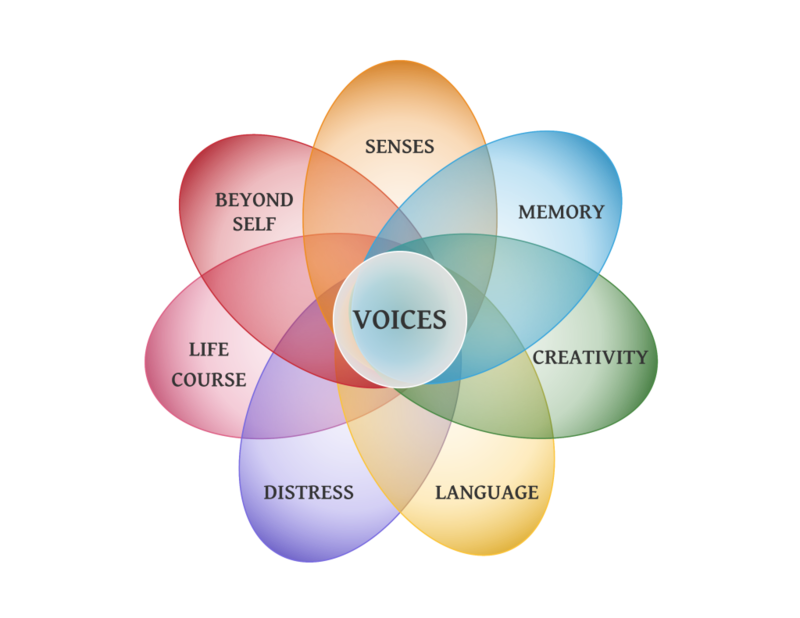 Once you can feel how much comfort your voice gives you, it becomes less painful to write out all of that suppressed trauma. Trust the words you remember from your childhood, Pat Schneider says in Writing Alone and With Others. Her Amherst method textbook has a chapter all its own devoted to voice. There’s a good book by Ben Yagoda, the Sound on the Page, that teaches about voice, too. When you write about something you care about deeply, you are likely to choose your Original Voice. Use simple language, most of us will. The Original Voice transports us to a place where we can forget to be afraid. Abraham Verghese broke into the world of letters in 1994 with his memoir My Own Country, but he’s come to better known for Cutting for Stone, a novel starring a character with many qualities in common with the author. In The Sound on the Page, Verghese was interviewed about voice and style and said this about writing nonfiction and memoir. To me, finding voice is about confidence. I struggled when I first started writing nonfiction. I had to speak as myself. There had to be a sameness and a tameness to my voice. And I had to learn that this ione of the great advantages of nonficton: when something is true, you automatically have the reader’s interest, because we’re all inherently curious about things that really happened. Few of us are famous. By definition, the word fame labels such people and things as well-known, and there are real limits on how much the world can know about somebody. If you’re like me and not famous, you can still have a memoir inside you, on your laptop, or in the pages of a favorite notebook, one that’s worthy of publication. You don’t even need to have experienced something as unique as cutting off your own arm to escape the wilderness. The key to getting your story into the world and creating a book is to do battle with the so-what moment. You do that battle with the fundamental tools of storytelling. Some of those tools help craft sentences and sections, and others serve to steer your story and reel in readers. Paula Balzer examines this in her book Writing and Selling Your Memoir. Some of the weapons to battle that moment — when a reader first sees yours is another story about a broken home, addiction, abuse, financial ruin, or infidelity — rely on the bedrock of voice and style. Your writing must emerge over so many words and drafts that you’re fluid in your voice: the writing that sounds like you and you alone. Everybody has memoir stories to tell, yes. But only you can tell the story in your voice. Style is comprised of rules and choices, but staying consistent with your voice is a great start to honing in on style. A hair stylist makes a statement for you when you emerge from their salon. Your hair becomes an expressive, emotional element when it’s styled. Your writing makes the same leap when you write towards exuding style. Style has elements, in the classic Strunk & White textbook The Elements of Style. Like the individual cuts, curls, and colors of the salon, the grammar, punctuation, and choices of those elements make up writing style. Like the hairdo that makes us look, good style compels reading. Although a memoir’s experiences may not be unique, even that can work in your favor. If a story has a high relatability factor — many of us have grieved for someone we’ve have lost — it’s easier for our readers to connect with us. At their essence, stories of marital infidelity are really about betrayal. If you’ve never married, you can still relate to betrayal. And betrayal, and its aftermath, contributes to a universal theme. The little guy who fights the big Goliath of a company can bring down an unfair competitor. But how? Showing us exactly which moments contribute to a universal theme propels a story about a hike through the Appalachians to overcome doubt about abilities (A Walk in the Woods, by Bill Bryson) beyond that story’s so-what moment. It was just a hike, so what? It was also a discovery about how a hiker is made, or born. And we connected with the main characters early enough in the story to stay on the scene and watch whatever happened next. In the big picture, the battle against the so-what moment is won or lost with effective writing. The elements are the same as for any kind of story, nonfiction or fiction. You need a good hook. Your story must rush to an engaging moment before the reader has a chance to ask that so-what question. That moment probably lives inside a scene I get to see as the reader. Many people have taken their kids on a two-week vacation in a car. The hook can be the quest for more than just pictures, souvenirs, and dog-eared programs. Those two weeks might be a way to find a proof of love, like a detective story. But only if that proof is elusive. I took a two-week road trip one summer across Midwest ballparks. But the perfect game was not the one I planned. Life is like that, if you’re lucky, and can stay out of your own way on the road. The sharpest tool in that box is theme, but it’s also the most elusive. You can work a great deal of the way into a memoir, or any book, before you discover the story’s theme. This is the spine that Sydney Pollack described when he was telling the story of how he directed Out of Africa. “We spent about two years trying to find what I always call a spine or an armature of this piece. Sort of trying to distill the idea down to one or two clear sentences that could be a guidepost,” he said. “What is it really about? We finally settled on possession. Freedom versus obligation. If I say I love you, what price am I expected to pay?” Out of Africa is based on Karen Blixen’s memoirs, by the way. “Most best-selling memoirs, if you were to boil the story down to their core, probably have the same story as someone who lives down the street from you, or as someone who works in your office,” Balzer writes. The memoir writer has to mix many additional elements into their book to compel a reader to click the buy button for $12, or carry that paperback to the register. The elements must come from the craft of writing, especially style and voice. One of my favorite Web sites for writing advice is the one at the Poynter Institute. Yes, it contains wisdom and training for journalists both green and experienced — but the lessons are often just about good writing. Especially when Dr. Peter Clark holds class online. 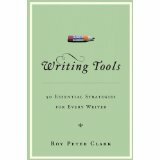 Across 2004 and 2005, Clark filled up a Writer’s Toolbox with more than 50 techniques, each about 750 words in length. Every one of them is followed by exercises you can apply to learn what he’d taught. Just at random, I found his entry on words that end in -ing. He says, “Let me offer reasons why ‘ing’ might weaken a verb. “1. When I add an ‘ing,’ I add a syllable to the word. This does not happen, in most cases, when I add an ‘s’ or an ‘ed.’ Let’s take the verb “to trick.” First, I’ll add an ‘s,’ giving me ‘tricks’; next, I’ll try an ‘ed,’ giving me ‘tricked.’ Neither move alters the root effect of the verb. But ‘tricking,’ with its extra syllable, seems like a different word. So while -ing is a natural part of English, and maybe a significant part of your true voice, it is gentle, not powerful. Clark has another column about some of the best advice he got on writing strong. He calls it, “Branch to the right.” It means get your subject and verb as close to the beginning of the sentence as you can, then follow them with your subordinate clauses. “Even a long, long sentence can be clear and powerful when the subject and verb make meaning early,” he says. Clark made “Branch to the right” his first of more than 50 tools. The advice feels fundamental. There’s plenty of it in his complete Toolbox series, which he has adapted into a fine book. We use -ing in a lively exercise in the Workshop, something to surprise us about the absence of a verb.